2 must-have products for creating perfect fall lips - from Clarins and Sephora! Clarins Instant Light Lip Perfecting Base - $25 - a non-drying lip base that instantly smoothes the lips and sets lipstick for hours - by keeping the colour from bleeding and holding it in place while moisturizing lips for up to 6 hours. 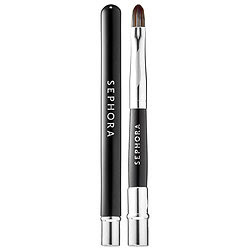 Sephora Pro Lip Brush #85 - $20 - offers precision application to create a perfect look and then can be stored in its protective cap to easily travel for touchups throughout the day.